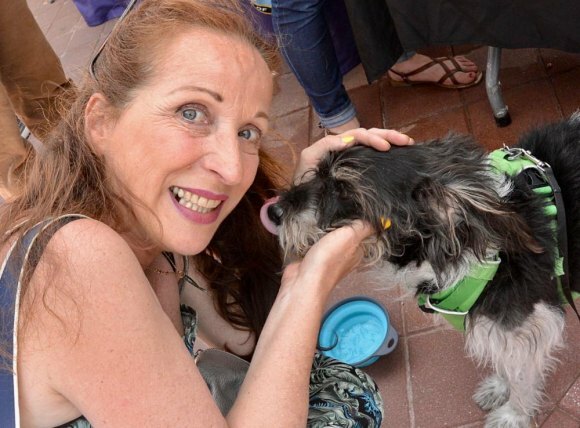 Wildlife Freedom Foundation Founder Rossana Ceruzzi with her newest best friend at Roosevelt Island Day, 2019. This year's Women's History Month Celebration takes place in the Memorial Sloan Kettering Auditorium on March 7th, beginning at 6:00 p.m.
Rossana Ceruzzi is an animal rights activist whose work on Roosevelt Island stretches back more than a decade. She's the founder of Wildlife Freedom Foundation and last year made her mark successfully resisting RIOC's inexplicable effort to evict the Southpoint Cat Sanctuary by turning off its water at the start of summer. Jennilie Brewster is the founder and project lead for OPEN DOORS at Coler Hospital. OPEN DOORS encourages creative activities for physically challenged individuals. Most visibly here, Brewster has enabled an emerging group of poets who've staged live readings at Gallery RIVAA. J. Khadijiah Abdurahman is a freelance writer and leader of Creator of WordToRI, according to the announcement.